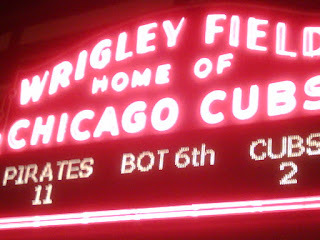 I'm in Chicago on business and ended up with tickets to a Cubs game. I had been to Wrigley once, about 20 years ago, so it was nice to see it again. The game wasn't much to see. 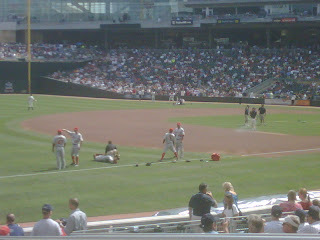 The Cubs were down by 2 before we got to our seats and it just got worse from there. You can see the score in the picture above when we left. A few nice returns waiting for me in my mail box today. 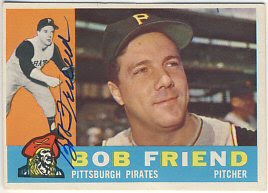 Bob Friend signed his 1959 and 1960 Topps for me. 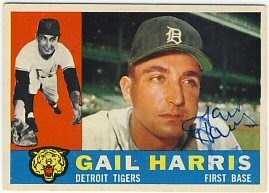 Gail Harris signed his 1960 Topps. 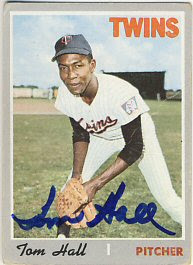 Harris played for the Minneapolis Millers back in the fifties so I asked him if he had any particular memories about his time playing here. He replied that he liked the fishing but did not care for the mosquitoes. 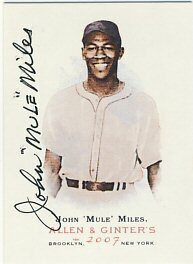 John "Mule" Miles signed his 2007 Allen & Ginter and wrote me a nice letter about being an Air Force mechanic after his playing days. 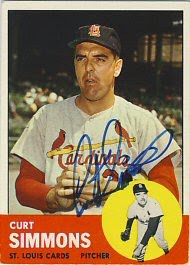 Finally, Curt Raydon signed his 1959 Topps in ballpoint. The signature is difficult to see. 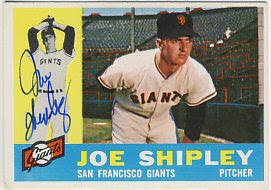 I won a couple of eBay auctions for 1972 Topps lots. One lot had 165 cards, and the other has 312 cards. Hopefully there's not too much duplication between the two lots. Regardless, these should give me a good start on the set. Another nice return today. 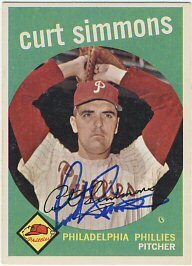 Curt Simmons signed four cards for me: 1959, 1962, 1963 and 1964 Topps. I don't normally send four cards, but for whatever reason I had them laying around so I sent them. I usually try to send one or two cards in a request, sometimes three, especially if I need all three for a set I'm working on. 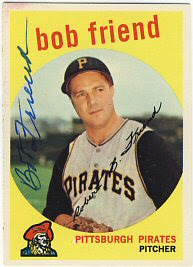 Speaking of which, I've been watching eBay for a nice big lot of 1972 Topps to work on. There are a few sets listed, I'm just trying to make sure the prices are decent, so I'm looking around a little more. I was out of town this week and came home to a few returns. About a week ago I sent out about 20 requests and I got three returns today. 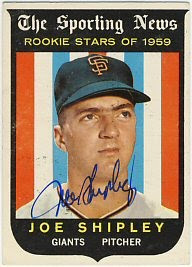 Joe Shipley signed his 1959 and 1960 Topps. 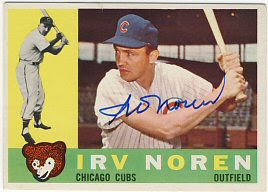 Irv Noren signed his 1960 Topps. 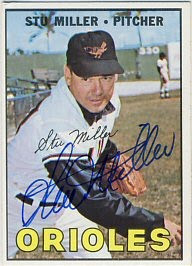 Tom Hall signed his 1970 and 1972 Topps. 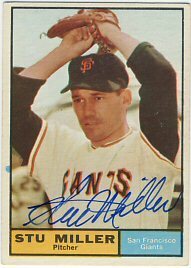 I've been thinking about a new project to start and I think I've decided to work on the 1972 Topps set. 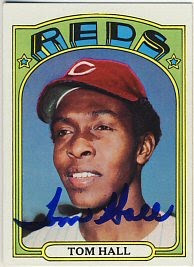 I used to really hate the set, with it's '70's-style lettering and odd color-schemed borders. For some reason now I think they're cool. Now I have to try to find a nice large lot cheap enough. I'm hoping to pay about 25 cents per card for a large lot. I've already started going through the checklist and identifying which players sign through the mail. I'm going to set a goal of 400 signed cards out of that set. I got another interesting return today. 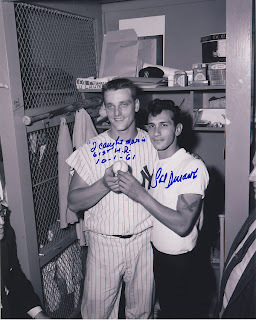 A member on SportsCollectors.Net is an acquaintance of Sal Durante. Mr. Durante is the fan that caught Roger Maris' 61st home run back in 1961. 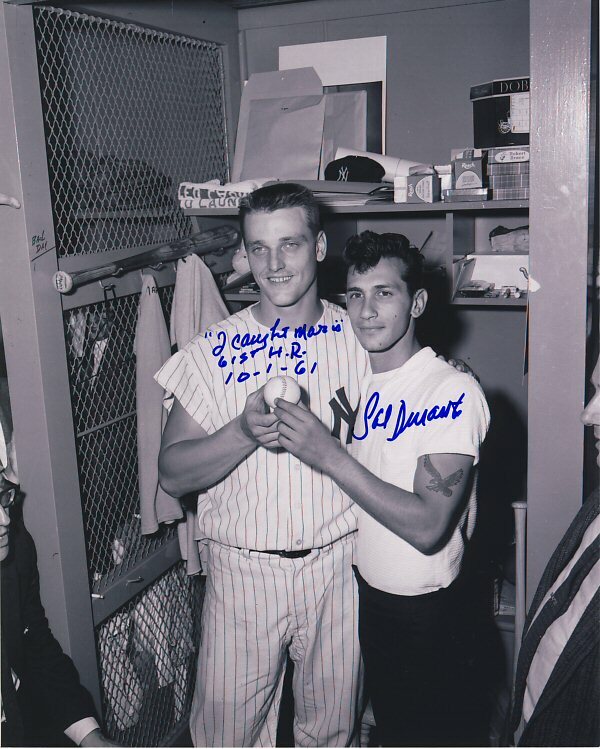 I got a picture of Sal and Maris, signed by Sal and inscribed with the date he caught the ball. 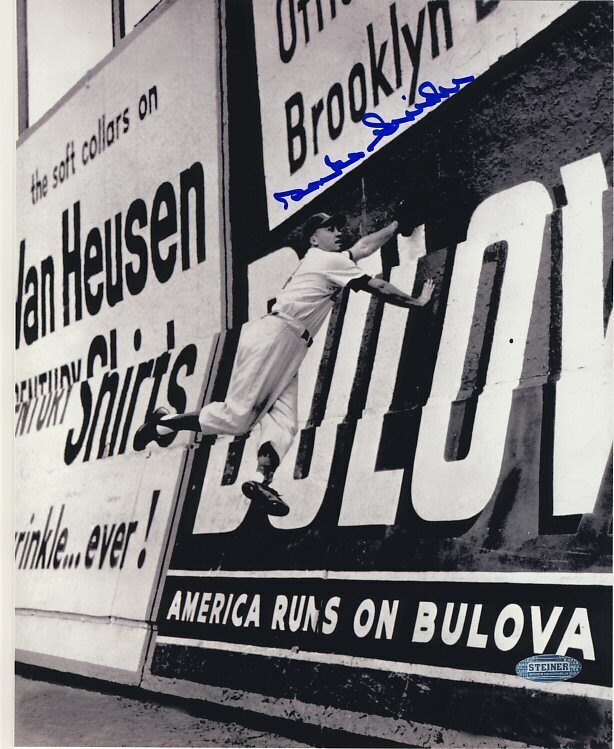 Sort of an odd item since Sal wasn't a player himself, but I think it's pretty cool and it was very inexpensive. I'm at the Twins/Angels game at Target Field. Another really hot day. Today I received a Liriano signed jersey from a signing by LK Sports that an SCN contact helped arrange. 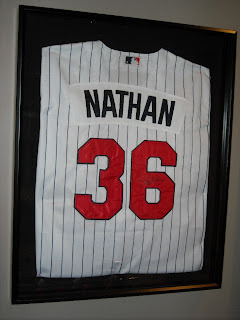 The nice part was I bought the jersey from them too, so I didn't have to pay to have a jersey shipped to me, only to turn around and pay to ship the jersey to the signing. 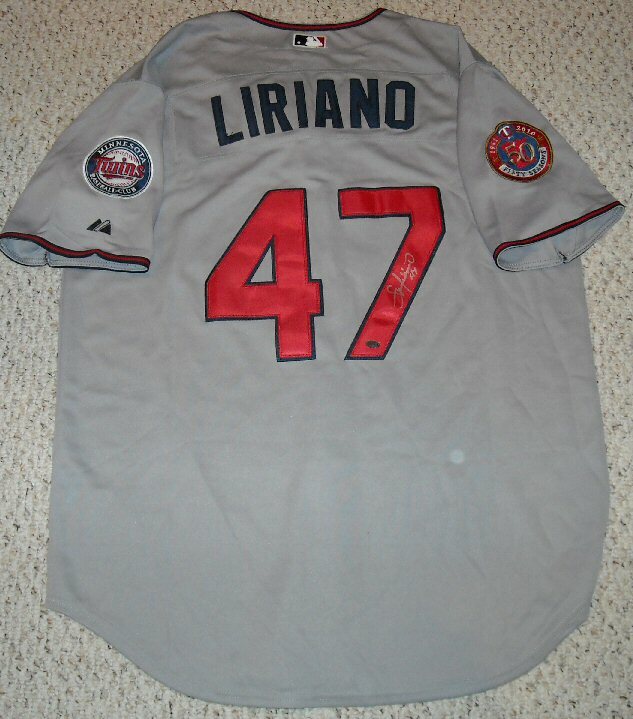 Despite continuing to win, Liriano has been struggling a little lately. He's had lots of runners on and has had to work out of a lot of jams. He only lasted a little over four innings last night, even though the Twins were able to beat the White Sox. 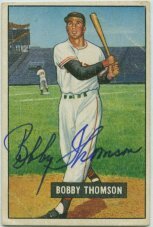 Bobby Thomson, the New York Giants slugger that hit the "Shot Heard Round the World" to win the 1951 National League Pennant, passed away yesterday at the age of 86. 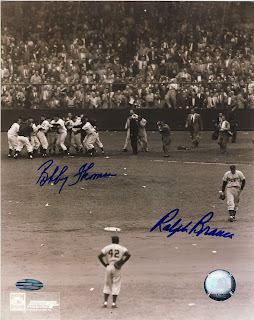 I posted just a few days ago about the photo I bought autographed by Thomson and Ralph Branca, the pitcher on the mound when Thomson hit his famous home run. Mr. Thomson was a very generous signer through the mail. 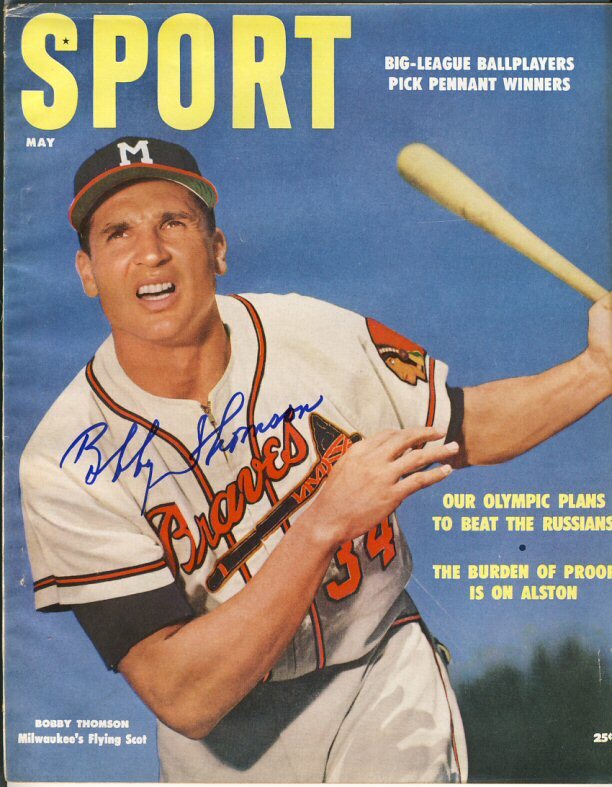 I received several autographs from him, including a 1958 Topps, 1949 and 1951 Bowmans, a 2008 Goudey, and a 1955 Sport Magazine. My son recently sent off a couple of cards to Mr. Thomson and sadly it seems he was too late. 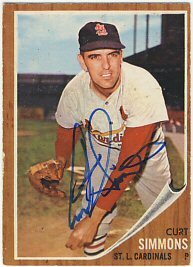 He had the cards sitting around for months and finally one day I set them in front of him with a pen and paper and told him to write. 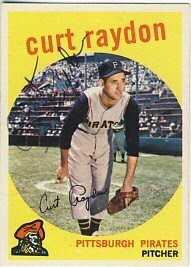 It's sad to see these players from the golden age of baseball passing away. 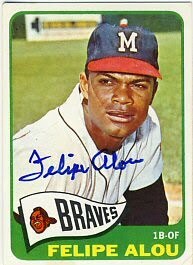 Today I received a card back that I sent to an SCN contact to have signed by Felipe Alou. 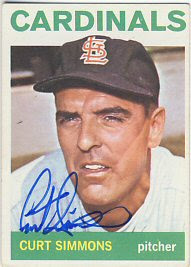 I had him sign a 1965 Topps for my set. This makes 350 signed cards that I have for this set so far. The line for Pavano and Valencia went very quickly. 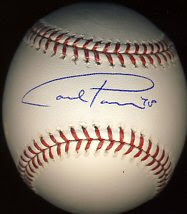 Pavano is pitching tonight so I'm surprised he had to do a signing like this. My wife was with me so we got two autographs from each of them. I got Danny Valencia to sign baseballs for both of my sons. 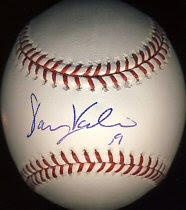 My older son missed the Twins Autograph Party and hasn't seen Valencia yet, and my younger son had Valencia sign a ball at the Autograph Party, but he signed it on the side panel, so I got a sweet spot signature to replace that. 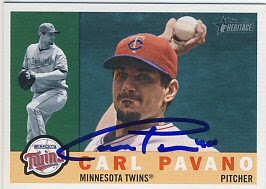 I had Pavano sign a 2009 Topps Heritage for my older son and had him sign a ball for me. 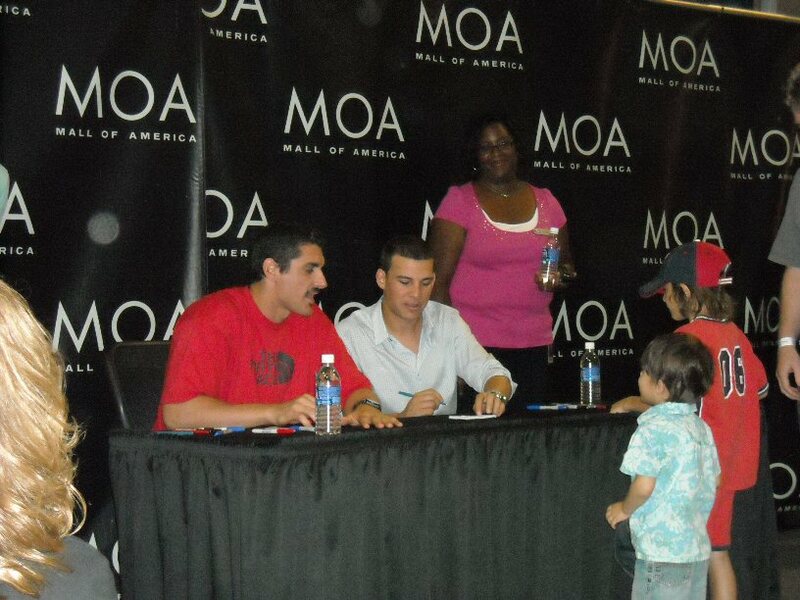 My wife and I made it to the Mall of America for the Pavano/Valencia signing. They are limiting the number of people by giving you a wristband when you enter the line. They've already run out of wristbands. I would guess there are 150 people in front of us, and 50 in back of us. I didn't bother bringing enough items to go through the line twice. Good thing, I guess. Last weekend I had some time to check out Cedar Cliff Collectibles and a few other "errands". 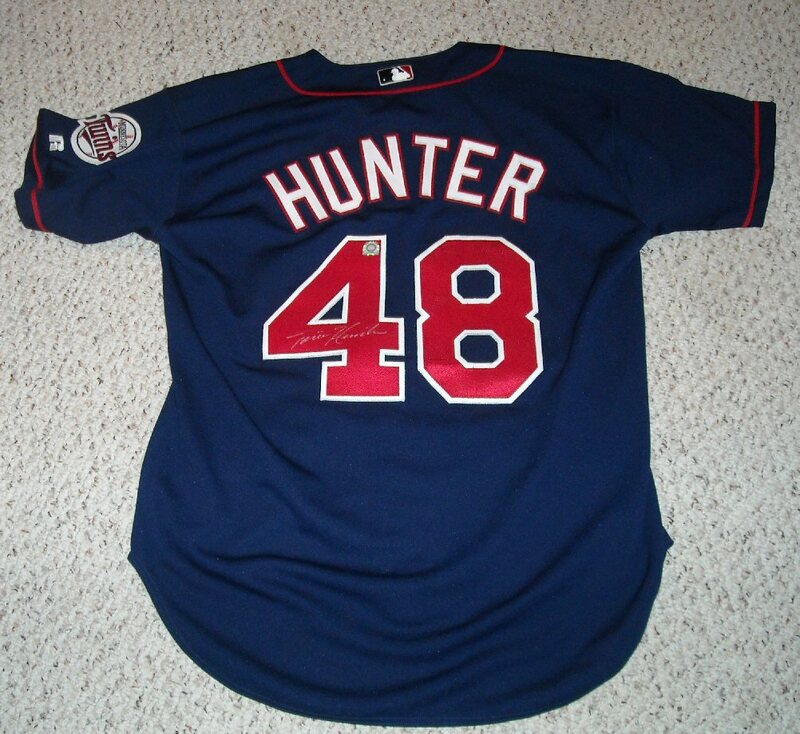 I was fortunate enough to find, and purchase, a Torii Hunter signed jersey. 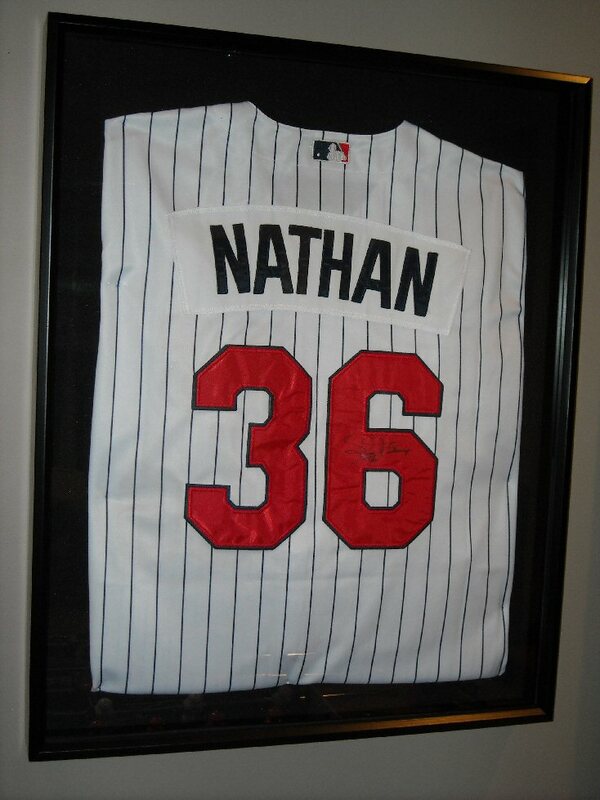 It is MLB authenticated so I looked up the number and learned that it was signed at TwinsFest in 2004. For only $80, I thought this was a real bargain, especially since I had some money I received for my birthday to pay for it. I also took some time to frame the signed pictures I got for my birthday. I also get these frames and mats at Michael's. They are very inexpensive. 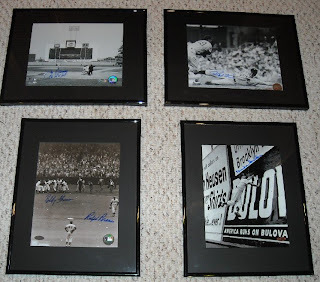 The frames are sold in pairs for about $6, and the mats are about $3 or $4. Danny Valencia and Carl Pavano are signing tomorrow at the Mall of America. I think I'll take my wife "shopping" tomorrow. A couple of weeks ago I ordered my birthday presents. Since my wife and kids really have no idea what to get me for gifts, I order things and they wrap them up and give them to me. This year I took advantage of a Steiner Sports sale. 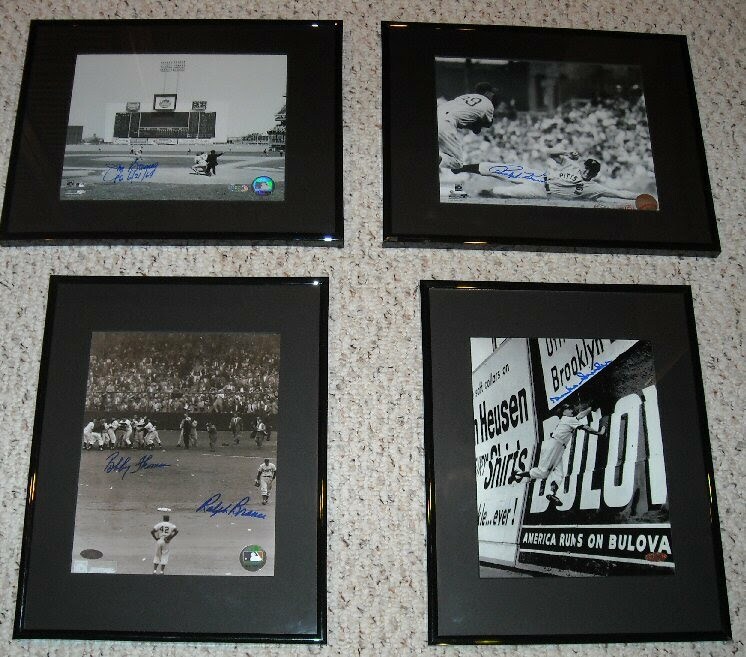 I bought four signed 8x10 pictures. 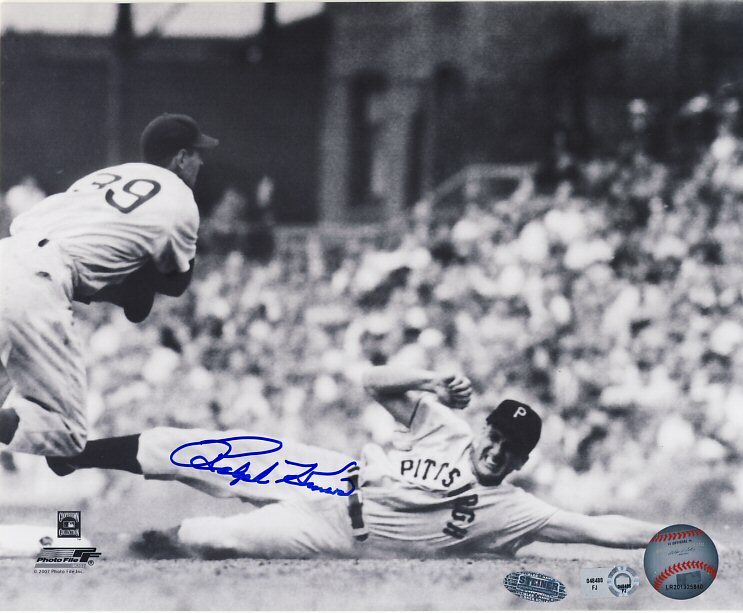 First, I got a nice signed picture of Ralph Kiner sliding. 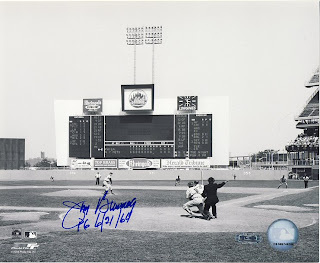 Next, I got a picture of a Jim Bunning perfect game. 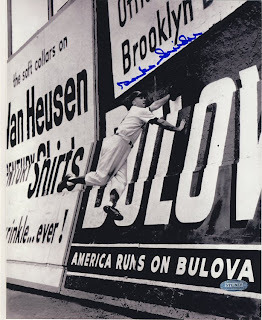 I also got a cool picture of Duke Snider climbing the wall to make a catch. 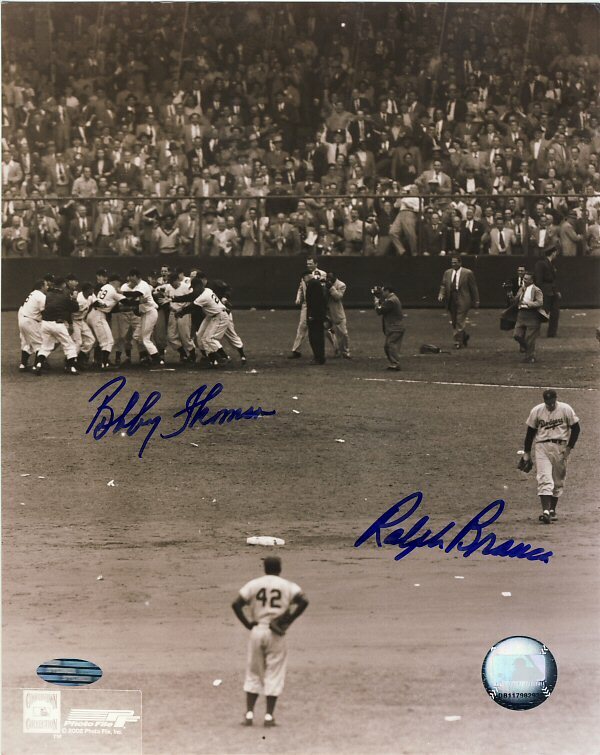 Lastly, I got a dual-signed picture of Bobby Thomson and Ralph Branca of Thomson's pennant-winning home run (with Branca being the losing pitcher). Notice Jackie Robinson watching the action. 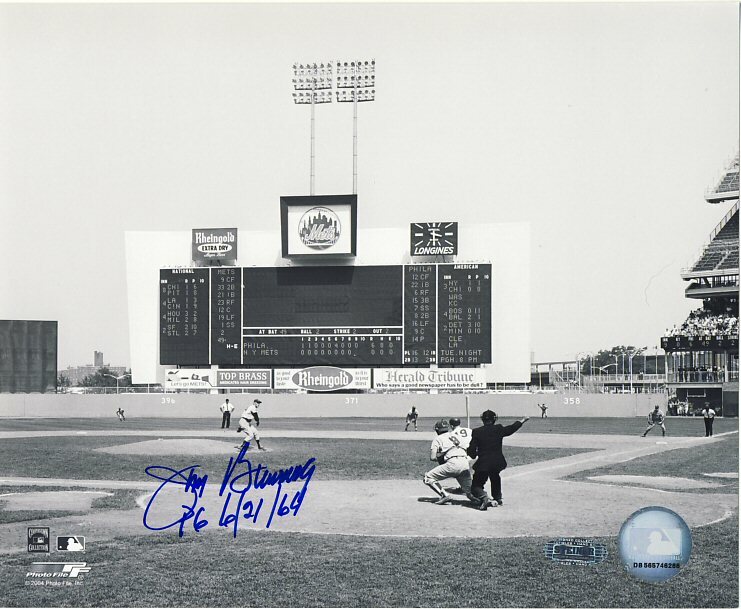 Trivia question: Who was on deck, ready to bat after Thomson? I sent out a few requests a little over a week ago. Today I received the first of those back. 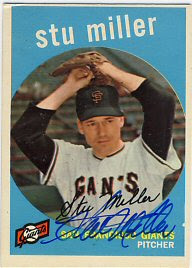 Stu Miller signed his 1959, 1961 and 1967 Topps for me. Not much else going on. I'll be out of town most of the rest of this week. The next week I have a few days of vacation, so maybe I'll have some time to write a few more requests.